Home / News / Restaurant offers churchgoers 10 percent off coupons. Here’s how atheists ruined it. Restaurant offers churchgoers 10 percent off coupons. Here’s how atheists ruined it. A Cheviot, Ohio, restaurant owner learned the hard way that it’s apparently not OK to give discounts to patrons based on their religion. 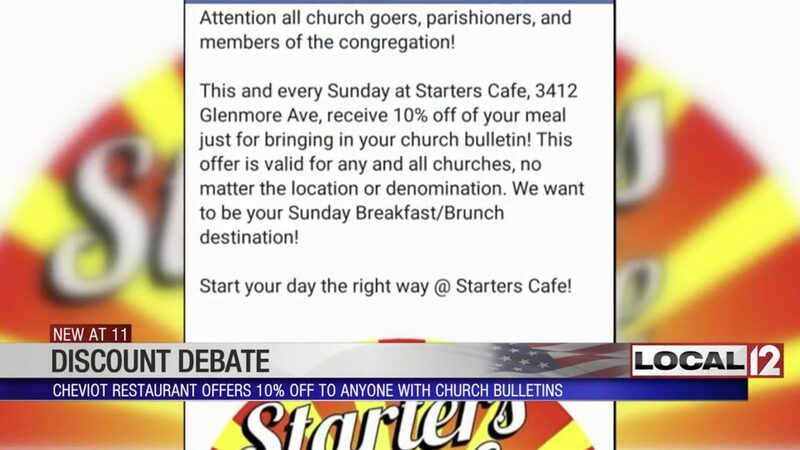 Starters Cafe in Cheviot was running a discount to local church parishioners for 10 percent off their tabs if they brought in and showed their Sunday church bulletin, proving that day’s attendance. Justin Watson, one of the owners, told WKRC-TV that all he wanted to do was get people in the door, and as the restaurant is placed within the range of several churches, he thought this would be a good opportunity to do so. “There’s been a lot of support,” he added. Watson noted that there wasn’t any problem at at — at first. But to one secular organization, it was anything but absurd. The restaurant received a negative Yelp review from a woman who castigated the promotion, according to Watson, and also a letter from the Freedom From Religion Foundation, which threatened legal action. “We are shocked that there is such little understanding of the Civil Rights Act and that there could be this kind of confusion, naïveté that you can reward some customers for their religious beliefs and penalize others,” Gaylor said. Watson ended up caving to the organization — and the woman who provided the negative Yelp review — and pulled the promotion, and apologized to the offended patron. “I realized there may actually be legal repercussions for this. So, in the end, I ultimately [ended up] recanting the offer and also issuing an apology to the lady,” Watson said to WKRC. Watson added that he’s not even particularly a religious person himself, but wanted to use the bulletin promotion as a marketing tool. “My busiest day of the week is Sunday, so, in my line of work, I’m not an incredibly religious person. It was just an attempt to drum up some business for my new business,” Watson explained. Going forward, any patron who visits the restaurant on Sundays from noon to 4 p.m. will receive a 10 percent discount — no church bulletin needed. Megan Fields, an attorney with Rendigs Attorneys at Law, told WKRC that the discount may or may not be considered discriminatory. “Because these people weren’t denied access to the restaurant; they were still permitted to come inside, eat the food and receive service. It’s essentially that they didn’t receive the 10 percent discount,” Fields told the station, noting that a simple way of getting around the promotion would be to simply get a bulletin from one of the many churches in the area.